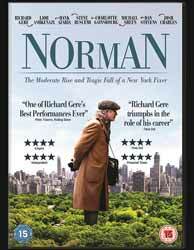 Norman: The Moderate Rise and Tragic Fall of a New York Fixer (2016. 1 hr, 53 min, 17 sec) is a tragicomedy written and directed by Joseph Cedar. The film stars Richard Gere in one of his most unusual roles to date as he plays the eccentric Norman, a man who everybody seems to know but also a man who nobody knows anything about. Norman has no office for his deals, just a cell phone and quick mind; he is not above lying to potential contacts. Norman may look like an unassuming later aged Jewish man but at heart he is a hustler always looking for the big payoff. Like the characters in the film, the audience learns little of Norman, few hints are given when he is investigated, but Norman remains to both the audience and other characters all facade. Richard Gere plays Norman with great empathy. We see him handing out cards purporting to be from his non - existent company and when asked what it was that he did, he answered that he was a consultant. In truth, we know that he is a chancer and not a very successful one at that. He is not above dragging his poor nephew, Phillip (Michael Sheen) into his elaborate schemes. His convincing front starts to get him into trouble when his status changes from a small time operator to someone who moves in a more rarefied milieu when he reconnects with Micha Eshel (Lior Ashkenazi) who is now Prime Minister. This opens many doors for Norman but for some unknown reason he finds it impossible to leave behind his old ways and some of the things which he promises are used as political capital to unseat the Prime Minister. He even lies to his Rabbi (Steve Buscemi), leading him to believe that he can raise fourteen million to save the synagogue. Norman is a character study of one man, not only his faults and weaknesses, of which Norman has many, but also of a strength of character which surprise even Norman. Gere is surprisingly good in the role, given the gravitas of the ending he carries off Norman’s quirks and peanut allergy well. It is probably the best role I have seen him in for a while. The DVD comes with a couple of extras, including An Evening with Norman: Q&A with Richard Gere and Joseph Cedar (21 min, 55 sec) has the two discussing the film and there is a shorter Making the Connection: Norman on the Red Carpet (4 min, 26 sec) which is another small piece about the film. The film has an English, French and Polish audio track as well as one English and nine foreign language subtitles as well as English SDH. The film is told with some real stylistic flair from the director and Gere offers up a solid and sympathetic character.